The spacious recently built townhouse can comfortably sleep a family of 6. The house has three bedrooms, two bathrooms, a sitting room, dining room, fully equipped kitchen, two large patios, small private terrace and communal swimming pool. 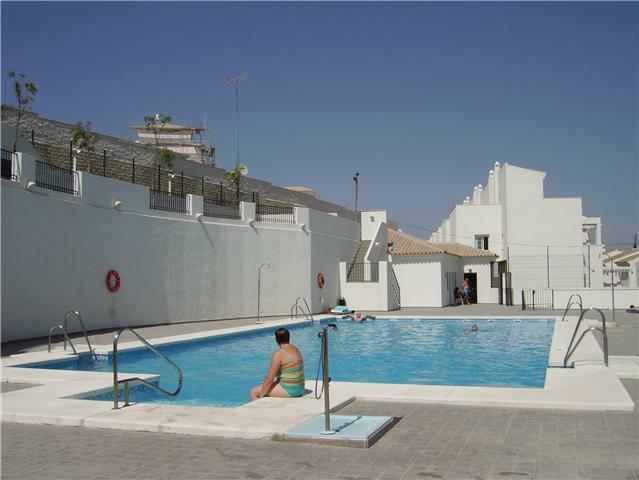 La Noria is a small development in a quiet area of Vejer and is a short stroll to local shops, bars and restaurants. In the summer months the swimming pool is shared with neighbouring houses comprising adults pool, childrens pool, sun deck, toilet/shower facility and is only a few steps from the house. A fabulous spot to cool off in the heat of the day. The house has a spacious living room and dining area with TV, DVD player and a selection of DVD's and 3 good sized bedrooms. The master bedroom has built in wardrobes, with full-length windows and a small private terrace. 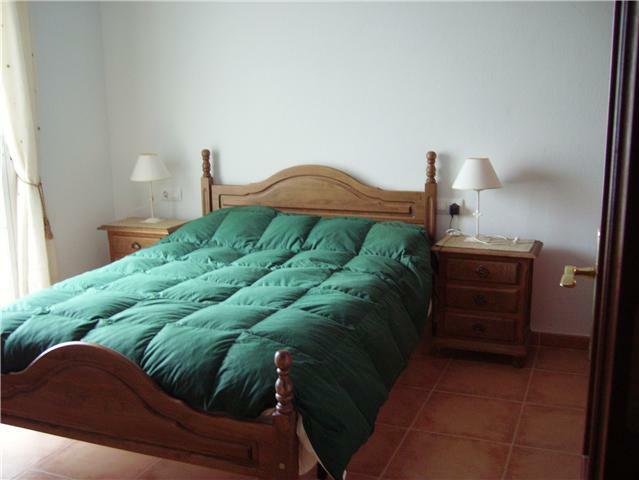 The second bedroom has twin beds and a small built in wardrobe and the third bedroom a sofa bed. There are 2 bath/shower rooms and a large, light, fully equipped kitchen with oven, hob, washing machine, dishwasher, fridge/freezer, toaster etc. which leads on to the very spacious back patio which is ideal for breakfasting or a cool drink in the evening. All bed linen and towels are provided. Esta casa del pueblo de reciente construcción puede alojar con gran confort una familia de hasta cinco personas. La casa tiene tres dormitorios, dos cuartos de baño, una sala de estar, un comedor, una cocina totalmente equipada, dos patios grandes, una pequeña terraza privada y acceso la piscina comunitaria. La Noria es una pequeña urbanización situada en una zona tranquila de Vejer, a un corto paseode tiendas, bares y restaurantes. La casa posee un amplio salón y comedor con TV, DVD y una selección de películas y tres grandes dormitorios. El dormitorio principal tiene armarios empotrados, con amplios ventanales y una pequeña terraza privada. El segundo dormitorio tiene dos camas individuales y un pequeño armario empotrado y el tercero un sofá-cama. Hay dos cuartos de baño con ducha y una cocina amplia y luminosa, completamente equipada con cocina, horno, lavadora, lavavajillas, frigorífico, tostadora,etc. Tiene acceso al amplio patio trasero ideal para desayunar o para tomar una copa por la tarde-noche. Toda la ropa de cama y las toallas están incluidas. Prices from 350 to 650 euros per week depending on season.